Like many teenagers before us, my best friend and I ate unconscionable amounts of gelato while traveling through Europe many years ago. Each gelateria boasted more exotic flavors than the last, and you had to try them then and there lest you never find that particular one again. My friend always gravitated toward the fruity flavors, usually ending up with a cone of ruby red berry sorbet and ivory yogurt gelato. I, on the other hand, unfailingly went for the most rich, chunky, decadent flavors; the gelati that oozed with caramel, dripped with fudgy swirls, and were studded with chunks of cookies, chocolate and nuts. It is said that the dessert world is divided into two camps: chocolate people and fruit people. I realized then that although I may have no longer fit into my pants, I did fit firmly into the former category. This explained why, as a child, I would always take a Milky Way over a pack of Jolly Ranchers; why I eschewed Cherry Garcia for Coffee Heath Bar Crunch. The world finally made sense. To this day, I tend to favor earthy flavors and fragrances over their fruity counterparts. Caramel, chocolate, vanilla, coffee, brown butter and aged spirits all make me weak in the knees. I’ve tried many times over the years to make fruit-based ice creams, but I never really loved the results. Whereas flavors like Irish Coffee, Mint Chip and Cacao Nib get demolished in minutes, fruit-based ice creams, sorbets and frozen yogurts invariably hang out in the back of the freezer until, needing to clear out space, I puree them into breakfast smoothies. But! Carey’s Roasted Apricot Buttermilk Ice Cream with Almond Streusel provided the inspiration to brave another fruit-based ice cream. I decided to compromise and add a healthy dose of earthy flavors: vanilla, bourbon, and chocolate flecks. I found a lovely recipe from The Craving Chronicles that I adapted only slightly by reducing the quantity so that it would fit in my ice cream maker, and adding more bourbon. I adapted my favorite Dreamy Vanilla Ice Cream, made slightly less rich to compensate for the booze which lowers the freezing point. 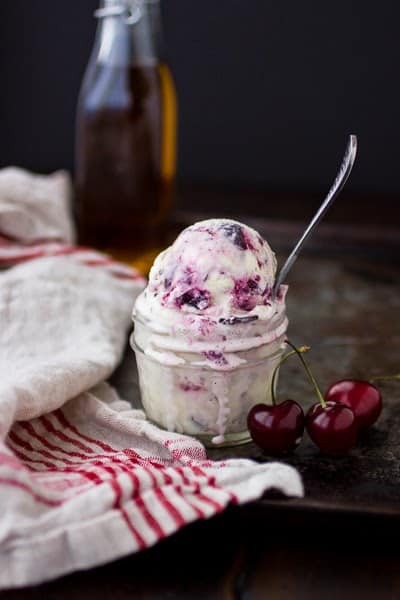 Some bourbon goes in the ice cream base, while some gets combined with cherries that have been roasted in a touch of sugar and still more bourbon. 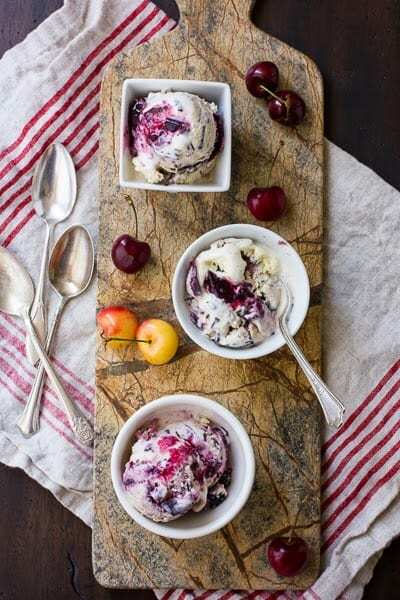 I found that churning the ice cream solo and stirring in the chilled cherry goop made the prettiest ice cream, with swirls of burgundy against ivory cream flecked with black vanilla seeds. I then employ David Lebovitz’s messy yet oh so fun “scribble” method for incorporating the chocolate (which I call the “Jackson Pollock” method in order to prove that my BA in Art History wasn’t a complete waste of time and money). This results in uneven chocolate bits that melt pleasurably on the tongue. Roasting the cherries rids them of the excess water that likes to freeze into icy bits, and steeping them in bourbon helps to keep them even softer in the finished product. 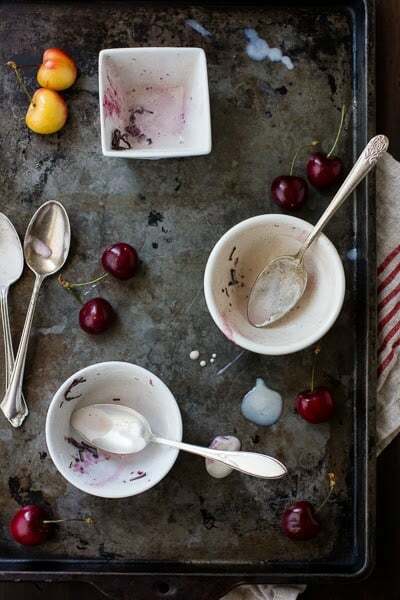 The roasted cherry and bourbon compote is worth making on its own; it would be delectable spooned over crepes, worked into a fool or trifle, or simply spooned over vanilla ice cream or sweetened yogurt. The slight booziness and concentrated cherry flavor reminds me of Marachinos, only much, much better. 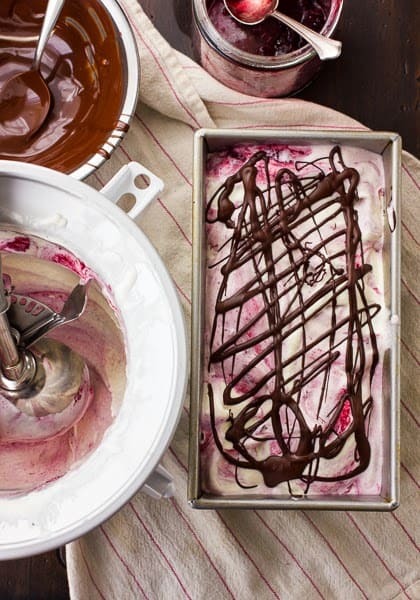 This ice cream will satisfy both the fruit and chocolate dessert people in your life. I’m pretty sure my fruit-loving best friend would dig it, and, well, it turns out I’m just as much a sucker for chunky, gooey ice creams now as I was 12 years ago. The bourbon keeps the ice cream soft and pliant straight from the freezer, making it a little too easy to help oneself to a bite or six at various times throughout the day. At least, unlike at a fickle European gelatria, I can have this ice cream as often as I like. You can substitute whole milk for the half and half for a lighter ice cream, if you like. I use Bulleit bourbon, though I think a rye whiskey would be quite nice as well. If you don’t have a vanilla bean, you can add 1-2 tablespoons vanilla extract along with the bourbon, to taste. Scharffen Berger’s bittersweet chocolate, with a cacao mass of 70%, is superb here; mild and nutty against the delicate cherry, vanilla and bourbon notes, and not too sweet. If you don’t have an ice cream maker, see David Lebovitz’s post on making ice cream without one. 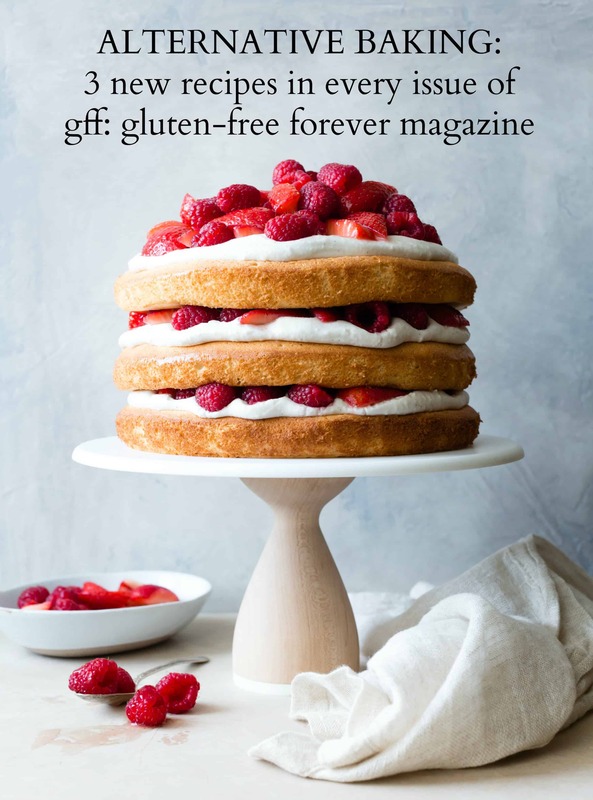 Great ways to use up those extra egg whites are: Brown Butter Coconut Almond Macaroons, Pistachio Chocolate Torte, Corn and Cheddar Spoonbread, and Buckwheat Hazelnut Brown Butter Cake. Position a rack in the center of the oven and preheat to 450ºF. 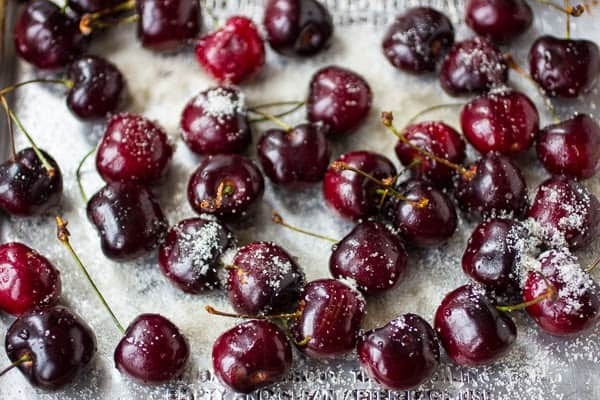 Spread the cherries in a single layer in a small, rimmed baking dish or pan. Sprinkle with the sugar and 1 tablespoon of the bourbon. 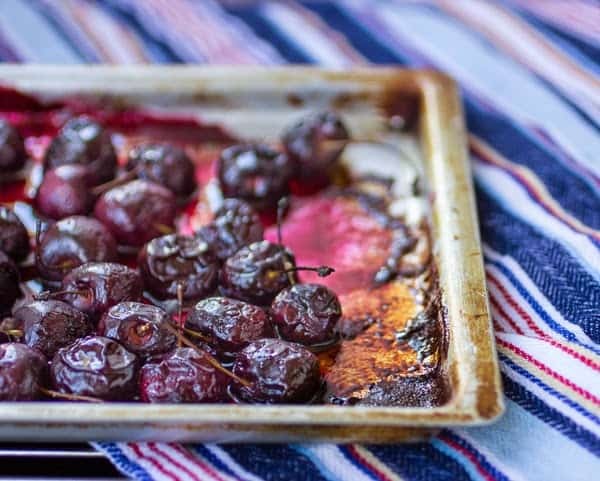 Roast the cherries in the oven, giving the pan a shuffle every 5 minutes, until they are oozing juice and beginning to collapse and look like prunes, about 15 minutes. Watch them closely so that the juices don’t burn. Remove from the oven and let cool. When the cherries are cool enough to handle, pit them (I did this with my fingers, breaking each cherry in half and removing the pit). Be sure to save all the precious juice. Chop the cherries coarsely – you want them in roughly quarters or eighths. (This can be messy, so wear an apron!) 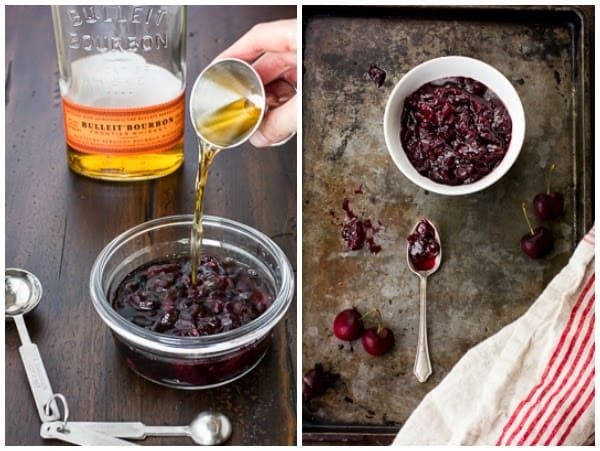 Combine the chopped cherries, their juice, and the remaining 2 tablespoons of bourbon in a jar and chill. In a medium saucepan, warm the half and half with the vanilla bean pod and scrapings over medium heat until it steams and small bubbles form on the bottom of the pan, swirling occasionally. Remove from the heat, cover the pot, and let steep for 30-60 minutes. Add the sugar and salt, and re-warm the half and half until steamy hot, swirling to dissolve the sugar. Place the egg yolks in a medium bowl, and set the bowl on a damp towel. Place the heavy cream in a heatproof medium bowl and set a fine mesh strainer over the top. 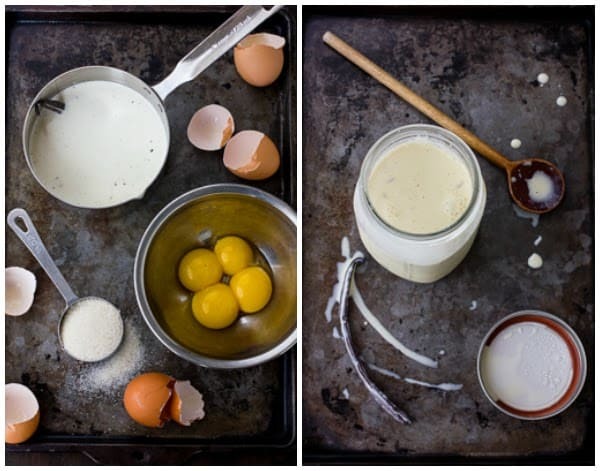 Whisking constantly, dribble the hot half and half mixture into the egg yolks. Pour the mixture back into the pot and set it over a low flame. Stir the custard constantly with a heat-proof silicone spatula, scraping the bottom and corners of the pot well, until the custard thickens slightly and/or registers 170º on an instant-read thermometer. This will only take a few minutes. Immediately strain the custard into the cold cream. Return the vanilla pod to the custard, and chill until very cold, at least 4 hours and (preferably) overnight or up to 2 days. 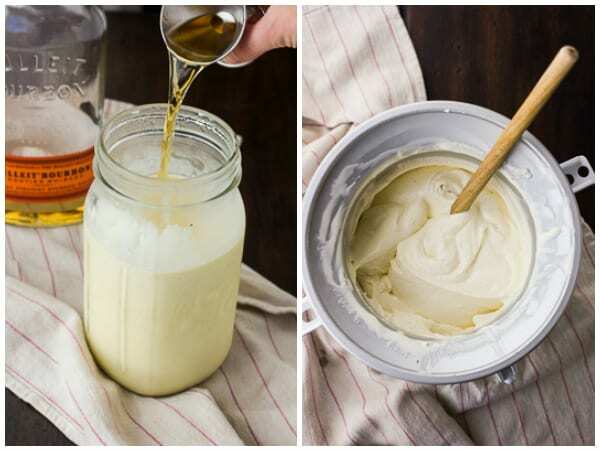 Stir the bourbon into the cold ice cream base. Remove the vanilla pod (you can rinse it, let it air-dry, and stick it in a bottle of booze or a jar of sugar). Place the ice cream base in the freezer for 30 minutes to get it really cold, stirring once halfway through. 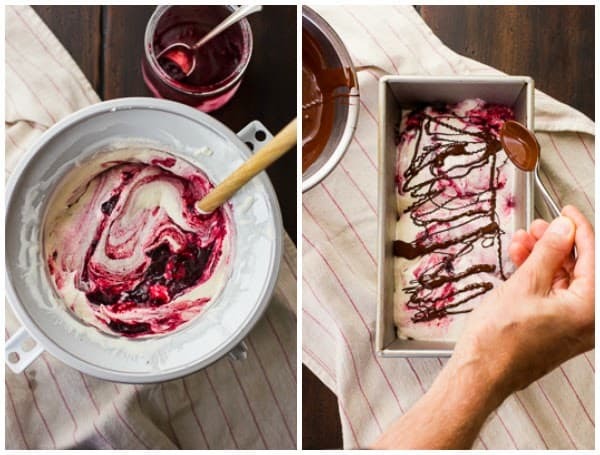 Place the cherries in the freezer, too, along with a 9×5 metal loaf pan (or a vessel of equal size that will hold your finished ice cream). 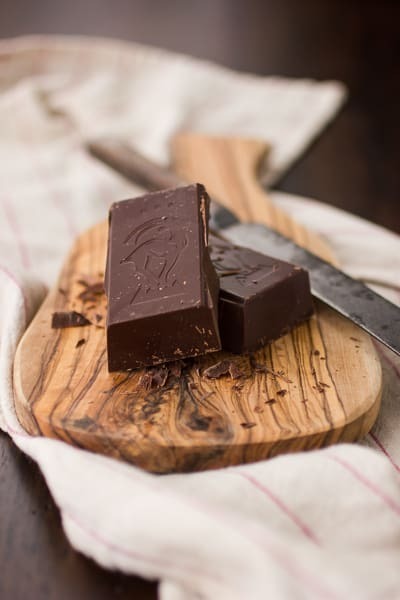 Meanwhile, place the chopped chocolate in a heatproof bowl, and set the bowl over a pot of steaming (not simmering) water, stirring occasionally until it is completely melted. Keep the chocolate warm. Churn the ice cream base in your ice cream maker until it is the texture of a thick milkshake; it will take a little longer than usual due to the alcohol. Gently swirl in the chilled bourbon cherries and their liquid. 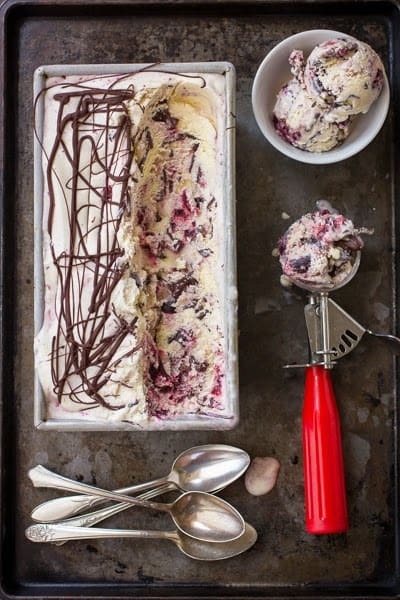 I like to do this by hand with a spoon, so that the ice cream retains a marbled look of burgundy streaks on white, rather than becoming uniformly pink. If the ice cream is soft and difficult to deal with, or if it becomes this way during the chocolate scribbling process, stick it in the freezer for 20 minutes or longer, until it’s cold enough to behave itself. Make sure your chocolate is warm and runny (but not hot). Working quickly to minimize ice cream meltage, spread about one quarter of the ice cream into the pan. Use a teaspoon to drizzle thin ribbons of about one quarter of the chocolate over the ice cream. Repeat with another layer of ice cream, then chocolate. Continue until you’ve used up all the ice cream, ending with a final layer of chocolate drizzle. Place the ice cream in the freezer to harden; this will take about 4 hours or overnight. Once hardened, transfer the ice cream to an airtight container. It will keep for several months. 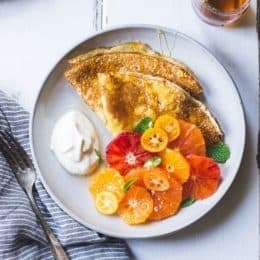 Growing up, I was definitely a fruit girl…I've found that my tastes have shifted more towards the chocolate in recent years (but I still have a fond place for fruit in my heart)! This ice cream though looks like it could win over both sides of the debate. Just heavenly! Yes!!! A big yes to this ice cream which is making me drool this morning. This sounds like the best ice cream I have ever heard! Thanks for the recipe! It's definitely one of my favorite ever ice creams, too; my sweetie and my friends are all going gaga for it as well. 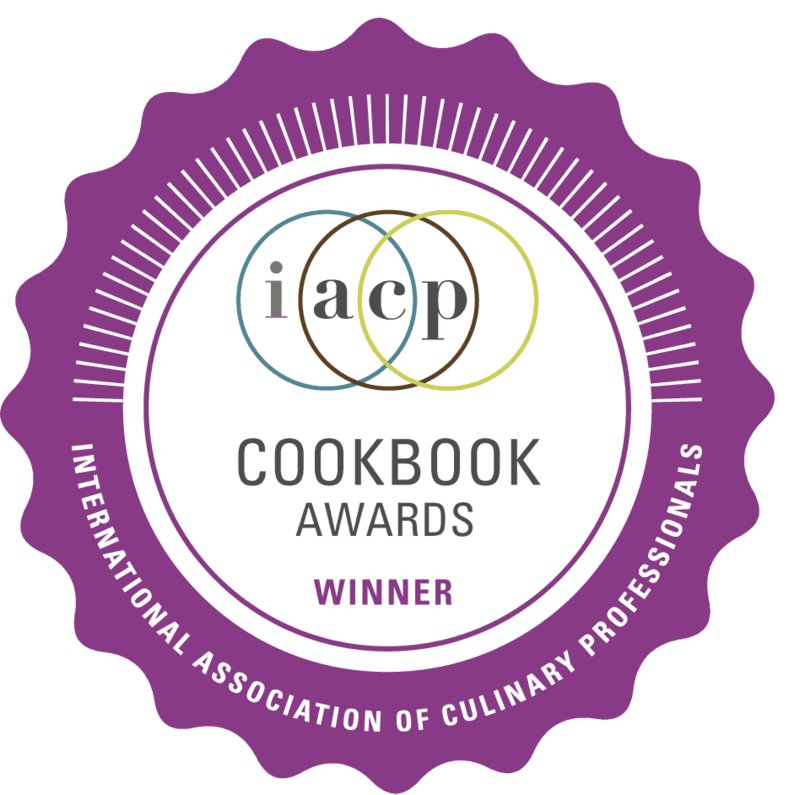 Thank you for such a perfect base recipe – I was really happy to find it, as well as the rest of your beautiful site! I really loved that chocolate + roasted cherry ice cream that I made last year, but I can kind of imagine how this one tastes, and I'm pretty sure it's even more heavenly! 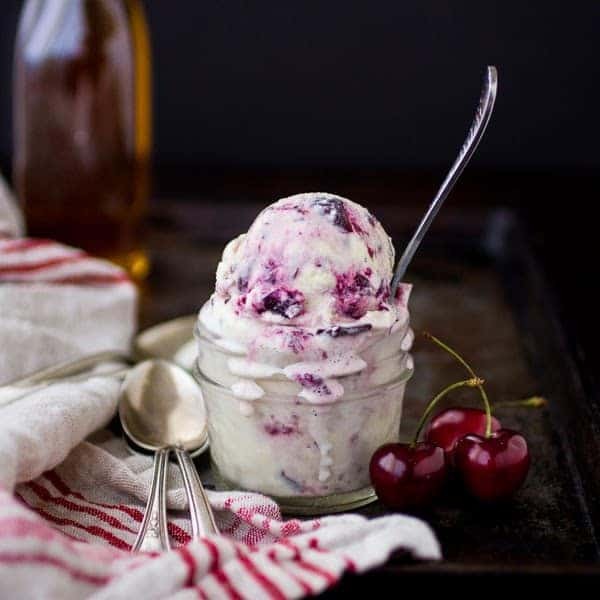 :D I mean, cherry + vanilla + bourbon is basically flavor combo perfection. And the cherry in the chocolate ice cream just kind of enhanced the chocolate flavor, whereas the vanilla against the cherry would be much more complementary, and really let the cherry flavor sing. And then the bourbon and the chocolate chips…yes! 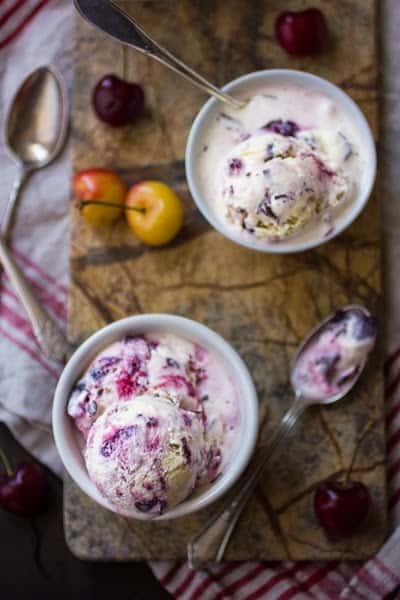 Our natural foods market is flooded with cherries at the moment, and I'm definitely grabbing a bunch so I can make this ASAP! Thanks, Carey!!! You are a huge photographic inspiration to me, so that makes me all verklempt–though I question your taste in Jolly Ranchers. ;) Black raspberry soft serve with chocolate sprinkles sounds killer! I absolutely alternate between both worlds, that´s why cherries with chocolate is one of my favorite combos ever. And cherries are probably my favorite fruit. This is some serious ice cream Alanna! And the pics are stunning. 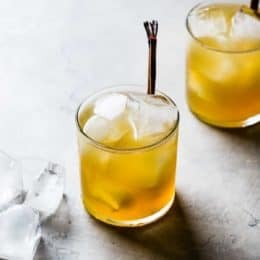 I love how you make so many boozy recipes! This ice cream looks SO delicious and I feel the same way about preferring chocolate, caramel, and coffee over fruit. Ha! Thanks, Shelly! 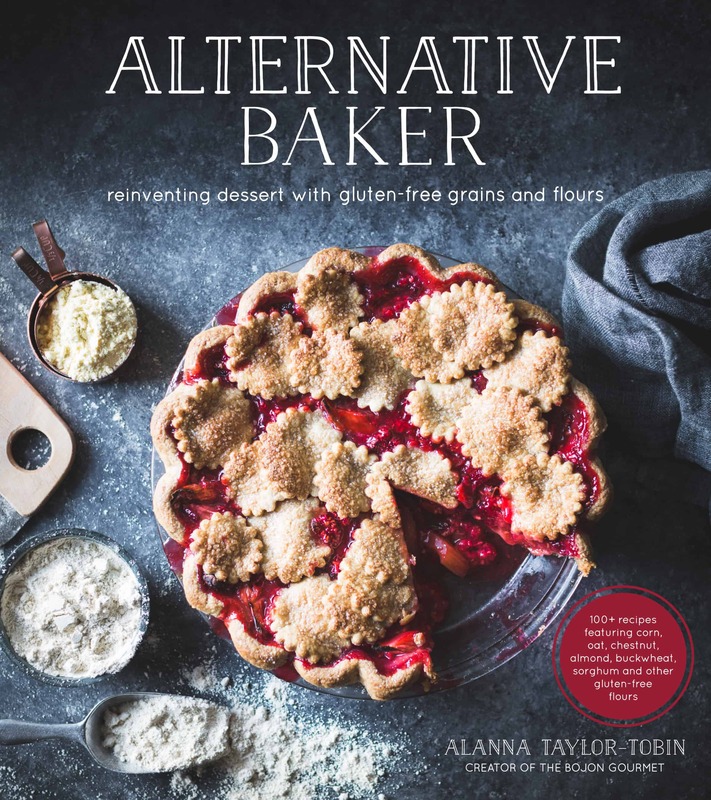 There's this book called The Boozy Baker; when I saw it, I was like, "Drat, I want to have written that." It's wonderful… the best ice cream I've ever made! Yay!!! SO happy you liked it! Yes, this is one hell of an ice cream.. I think the best I've ever made. Had it for breakfast this morning!!!! Aw!! That's awesome! (Apologies for missing this comment – so sweet!) I'm a fan of ice cream for breakfast, too. Don't tell. This ice cream sounds incredible! 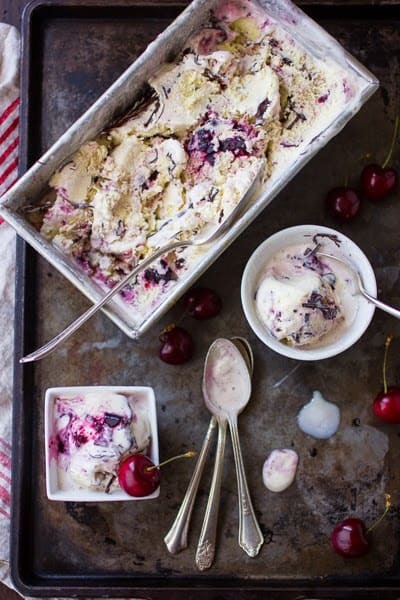 Roasted cherries seem like the perfect addition. Adding bourbon so it doesn't freeze rock hard is a great idea too. Can't wait to try this! I happen to have some cherries in the fridge just begging to be part of something so fabulous. Wow wow WOW! This is really good ice cream. I used a combo of Ranier and red BC cherries That I soaked in Scotch whiskey as I didn't have bourbon. The only dark chocolate I had in the pantry was a mocha bean bar which turned out to be really complimentary. I'm so happy my husband doesn't like cherries! More deliciousness for me! I just discovered your blog via Pinterest. I think I'm in love (in a purely culinary/platonic sorta way). This is a must-try. Chocolate, cherries, bourbon and vanilla? In gelato form? There is no way this can go wrong–even if it doesn't fully freeze, it will make the best damned frappe on the planet. since you like bourbon and chocolate, you might like my recipe for chocolate bourbon. time consuming, but worth it. the nibs retain a fair about of flavor, dry them and repurpose. Woah, you are blowing my mind here! That sounds like my dream come true. I can't even imagine how good that would be in this ice cream. Thank you for sharing your recipe, Lynn! re this bourbon in the ice cream: my thoughts exactly. as soon as i work off some of the holiday excess, i'm going to try a version i saw on nigella: beat together 2 cups heavy cream and a can of sweetened condensed milk until soft peaks form, add some vanilla (and bourbon), then the cherries. can go right in the freezer; no machine required. 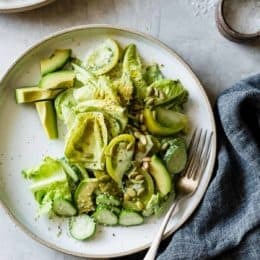 I'm definitely a fruit person and this recipe sounds fantastic. Lovely recipe. I made it using rum instead of bourbon. It was fantastic–a big hit with my ice-cream loving husband. Well…cherries $2.88/pound, too many eggs because they were on sale if I bought 2 dozen, and always bourbon in the cupboard. We have a plan for this week! Thanks! !